Get ready for yet another round of litigation over Obama-era methane rules. States and environmental groups are going back to court after the Trump administration suspended an Interior Department rule designed to curb methane waste from oil and gas operations on public and tribal lands. In two lawsuits filed in the U.S. District Court for the Northern District of California, the rule supporters say Interior Secretary Ryan Zinke and the Bureau of Land Management violated the law by sidelining the methane venting and flaring regulation until early 2019 (Greenwire, Dec. 19). "We are hoping to prevent methane waste and restore some transparency and accountability at the federal level," New Mexico Attorney General Hector Balderas (D) said in a call with reporters yesterday. "Quite frankly, Secretary Zinke's action to suspend the BLM methane rule is not only short-sighted but ignores the strong local and national support for curbing methane waste." The lawsuits are the latest in a game of legal pingpong that started immediately after the Obama administration finalized the rule in November 2016. The BLM rule aimed to cut waste of methane from well sites across the West, where drillers sometimes vent or flare the potent greenhouse gas when they lack equipment to capture excess volumes. The regulation set limits on emissions and required companies to check for leaks. Interior's move to suspend the regulation follows the president's March "energy independence" executive order favoring domestic fossil fuel development. In announcing the rollback, BLM questioned whether it had authority to issue the regulation in the first place — building upon criticism that the rule amounted to an air quality regulation better-suited to U.S. EPA, states and tribes. The agency also reworked the cost-benefit analysis for the regulation and concluded that the cost outweighed potential benefits. Oil and gas boosters have long complained that the rule was costly, unworkable and unnecessary in light of industry's own attempts to reduce methane emissions. Environmental groups suing to reinstate the rule say the Trump administration rolled back the measure as a handout to oil and gas companies. "Rather than moving forward to implement this common-sense rule that prevents waste, saves millions of taxpayer dollars, and protects the air we breathe, the Trump administration is wasting everyone's time with yet another attempt to stop the rule from taking effect, all to appease its friends in the oil and gas industry," Earthjustice attorney Robin Cooley, who is representing members of the environmental coalition, said in a statement. Supporters of the Obama rule have hailed it as a win for both the environment and taxpayers who receive royalties from the recovered gas. In a press call yesterday, Aztec, N.M., City Commissioner Katee McClure warned that the suspension would mean a significant loss in potential royalty payments that help support local schools and other needs. "I was really excited when the BLM methane waste rule was finalized to ensure not only people in my area but all over New Mexico got a fair return on the oil and gas that was developed in our area," she said. "But now that rule once again has been delayed, and our communities lose out on these revenues that would be generated from capturing this horrible waste of methane." BLM previously estimated that the rule would generate up to $14 million in additional annual royalties. The agency does not comment on pending litigation, but industry groups were quick to slam the new lawsuits. "I think you have some AGs who are trying to make a name for themselves by opposing responsible oil and natural gas development whenever they can," Western Energy Alliance President Kathleen Sgamma told E&E News. "Obviously you have very well-funded environmental groups that have plenty of money to sue, so I don't think it will never end." Independent Petroleum Association of American spokesman Neal Kirby similarly dismissed the challenges as "short-sighted" opposition. He argued that royalties lost by shutting in production due to high compliance costs would outweigh any gains from recovered gas. He noted that both California and New Mexico have authority to enact their own state-level restrictions if they see fit. Both IPAA and the Western Energy Alliance are weighing whether to intervene in the new litigation. Yesterday's lawsuits challenge the Trump administration's suspension of the rule as a violation of several laws, including the Administrative Procedure Act, National Environmental Policy Act, Mineral Leasing Act, and Federal Land Policy and Management Act. They say BLM had no rationale for the rollback. "Defendants entirely failed to consider how the Suspension would fulfill the important statutory mandates that the Waste Prevention Rule was designed to address, failed to explain why it reversed course based on the same information that it considered when it formulated and promulgated the Rule just a year earlier, and offered a purported justification for the Suspension that runs counter to the evidence before the agency," California and New Mexico's complaint says. They also argue that BLM's process for considering the suspension was unfair, as the agency had already determined the outcome. The filing notes that while the 30-day comment period on the proposal was still open, the agency told a Wyoming court that the suspension would "provide immediate relief" for industry groups concerned about the regulation. The two lawsuits also take aim at BLM's cost-benefit math supporting the rollback. 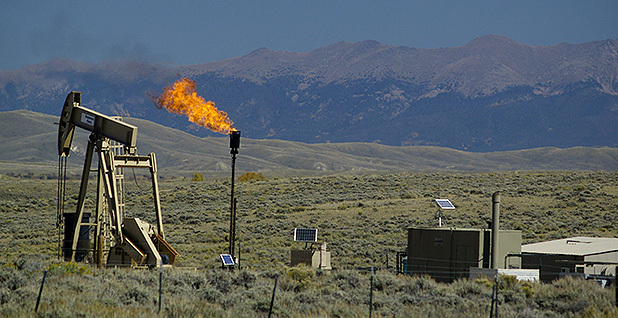 The rule supporters argue that the agency changed the way it calculates the social costs associated with methane to dramatically reduce the overall benefits of cutting emissions. "The estimate used to evaluate the Waste Prevention Rule is based on peer-reviewed literature and analyses that have undergone extensive public comment and external review," the environmental lawsuit says. "The estimate used to evaluate the [suspension] has undergone no such review. Indeed, the Amendment is the first time the federal government has relied on this estimate in a rulemaking." They added that the agency should have taken a closer look at the environmental impacts of freezing the Obama rule. The environmental lawsuit also alleges that BLM failed to adequately consult with American Indian tribes affected by the suspension, sending just two letters and making one follow-up phone call. Sam Dee, a member of the Navajo Nation's Red Mesa Chapter House in Utah, said the agency made little effort to reach out to tribes. "There is no question that BLM has a duty to consult with tribes and individual Indian mineral owners when they consider actions that would impact our oil and gas resources, which they failed to do," he told reporters yesterday. Supporters of the Obama administration's rule have already won one lawsuit challenging Trump officials' attempts to sideline the methane rule. When the agency used an Administrative Procedure Act provision — Section 705 — earlier this year to postpone compliance deadlines, the same California district court handling the new cases rebuked the government (Energywire, Oct. 5). The new lawsuits involve different legal issues. Sgamma noted that the recent suspension went through a full public comment process. "This suspension rule went through notice and comment," she said. "It went through the full APA procedure. It is not at all like the 705 stay that was overturned."